Geneva College is committed to student-centric pricing, helping every student receive a Christ-centered, quality education at an affordable cost. 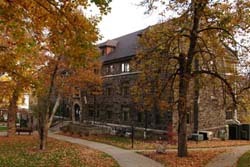 Geneva College's tuition is less than most private colleges and universities in the United States. In addition, nearly 100% of first-year Geneva students receive some kind of aid. Our Student Financial Services team is available to help explore the various types of assistance available to help make your education affordable. Full-time tuition and fees include use of the library and the physical education facilities of the college; admission to all home sports events and a subscription to the student newspaper. For undergraduates, a schedule of 12 to 20 credit hours is considered a full semester load and is subject to the regular per semester tuition and fees. Tuition charges for less than 12 hours or more than 20 hours, and for summer school students, are charged on a per-credit basis. Full tuition is charged for a repeated course. *Certain courses may have additional fees charged. The 1-2-1 Nursing Program has a reduced tuition rate of $23,520 for the 19-20 academic year. During the first two weeks of the semester, the College will apply tuition charge adjustments that occur as a result of a major change. After this time, the change in tuition charge will apply in the following term. Parking permits will be $80 for ALL students in the 2019-20 academic year, and your payment for the parking permit is due at the time you complete your online application at https://mygeneva.edu. *Traditional Undergraduate bills are due on August 10th for the Fall semester and January 2nd for the Spring semester. * The cost to audit a Fall/Spring course is $465/credit. *Summer Undergraduate bills are due on May 6th. * The cost to audit a Summer course is $333/credit. *Adult Degree Program bills are due 10 days before the start of the semester. Course and administrative fees are not refundable. CCO Staff Members can check with the CCO or hed@geneva.edu for information regarding CCO billing. Graduate tuition bills are due 10 days before the start of the semester, or for MBA students only, 10 days before the start of each course.